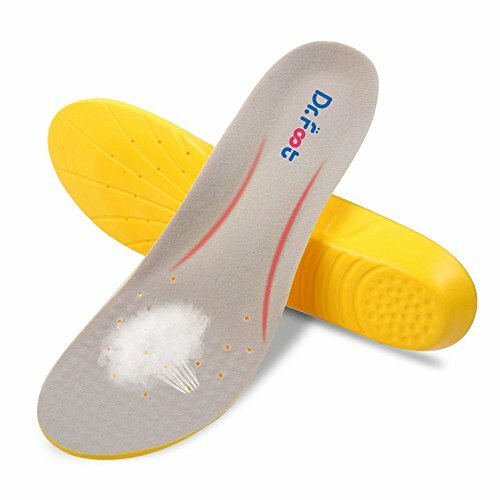 HIGH ARCH SUPPORT: The high arch support designed insole has changed the force structure of the foot,provide ideal solution for those with flat feet, rigid steps, high, weak, fallen arches. FUNCTIONALITY: The high ARCH SUPPORT can alleviate pain of the foot. Reduction of fatigue when walking or sport.It is suitable for sports shoes, flat shoes, boots, and even all shoes.Flexible and soft foam give the feet support and comfortable whole day. MATERIAL: Made of high-quality and durable medical-grade Velvet and PU material,which is safe to human body,Environment-friendly product,No toxic and side-effect to use,it\'s suitable for Men, Women and Kids..
SIZES:Insole size can be cut according to your shoes, in the back of the insoles have a clear cut line. there are three sizes can suitable for anyone. You can choose the size that suits you. QUALITY GUARANTEED: 12 months warranty & 30 days money back guarantee,If you are not satisfied with the insoles, just return them within 30 days for a full refund.Friendly customer service.Don\'t hesitate to contact us,If you have any questions.